Picking out a motorcycle is like picking out an extension of yourself. It matters a lot what it looks like, what it has on it. Even if you don't care at all it reflects back on your laid back personality. A special edition Ural Gear Up has rolled out to center stage with the Sportsman Package. 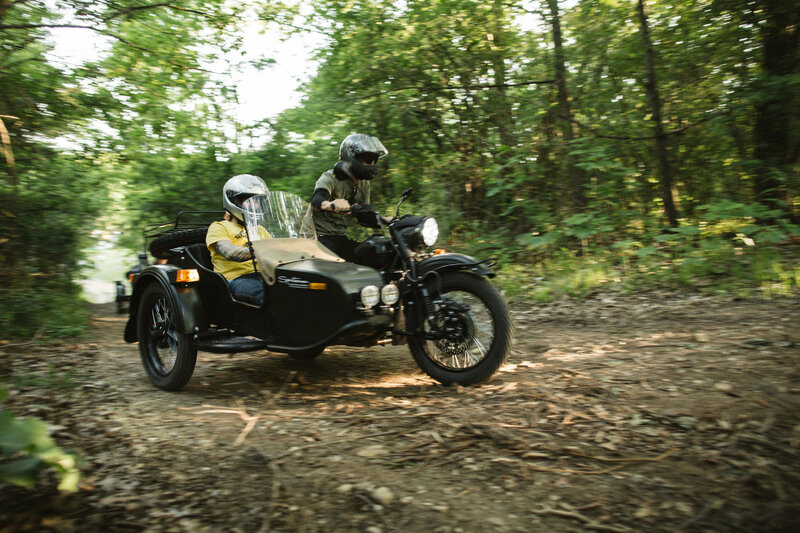 With a custom color and new decals a Ural has never looked so elegantly rugged and ready for a ride through the wilderness. If the outdoors is your passion and where you belong the Sportsman is for you. It was made especially for camping and ripping it up around any trails you put it on. Ural the company, took their Gear Up and prepared it for camp, introducing the Sportsman Package, Camp Wandawega Edition. Ural invited an eclectic group of journalists, photographers and some very special Ural riders to spend an ultra fun weekend riding, talking and filming Urals. The event was a huge success and Urals impressed most demanding riders and passengers! This special edition Gear Up tore up and down the trails of camp. Now this package is available to the public. Ural of New England is offering this one of a kind package with over a $400 savings on the accessories along with additional discounts. So, is this the bike for you? When you look at it do you feel it calling your name? It's calling someone's name. Be the first to answer. Grab your fishing gear, pack up the tent and sleeping bag, it's time to grab this summer in stride. Want to see the sportsman first hand in the woods? We will be taking this bike to the New England Bushcraft Event on April 28th. Come hang out and watch this bike take on the dirt track with ease. Interested, but can't make it to the event? Visit our website: AlphaCars and Ural of New England.